Winter hibernation is over. It’s time to get fit and (gasp!) have fun while doing it. You read that right; it’s not as far fetched as you may think. Sure, you still might have to put on a few extra warm layers, but once you’re outside and filling your lungs with fresh and tasty air, it doesn’t even feel like exercise anymore. Kids love being outside and exploring, which makes the King County Parks Fitness Challenge the perfect (free!) program for the whole family to enjoy – bonus! 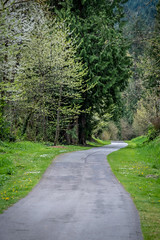 Plus, it’s easy to sign up and we’ve put together 30 activities to choose from that offer a variety of fitness opportunities throughout our King County Park system. On Martin Luther King Day my family and I decided to celebrate with a little hike. 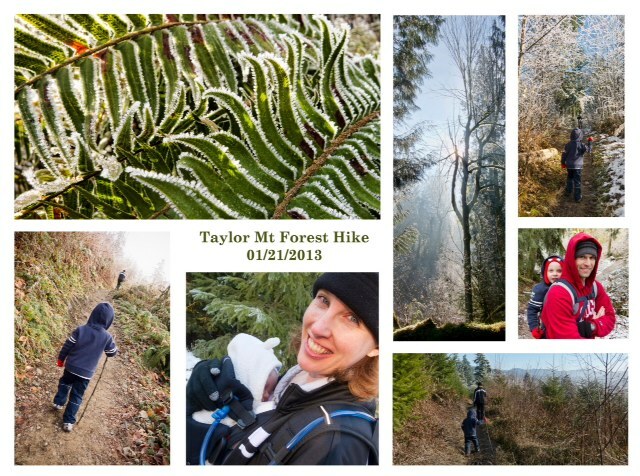 The 4 of us bundled up and headed out to Taylor Mountain, just about 5 miles NE of Maple Valley near Highway 18. The trail starts out fairly flat and then winds up hill for about a mile. Once out of the fog, there were great views and lots of sunshine, so we took a break and ate our picnic lunch. After lunch, we continued winding up, down and around on the trail enjoying all of the frost on the leaves, the sun rays through the trees and fog and we even spotted a big woodpecker tapping on a tree. Overall it was a great hike, probably about 3 miles of moderate hills and good little workout for all of us. We had a fun mix of fog, snow, sun, mud, frost and lots of smiles! 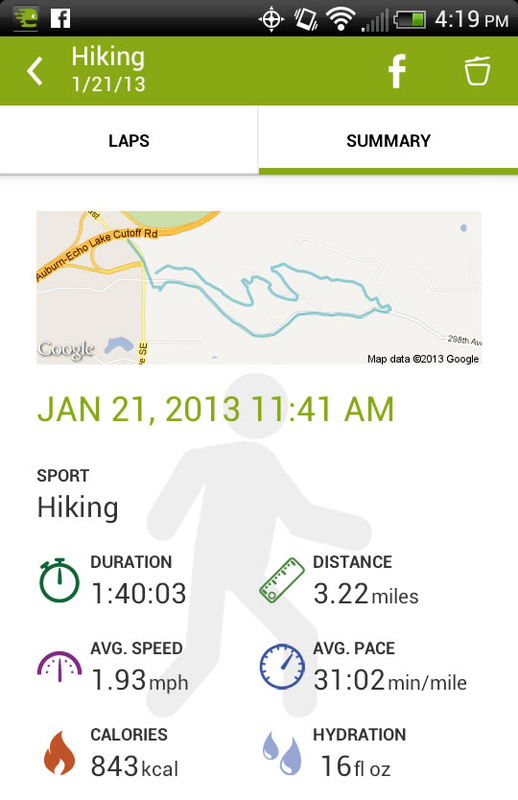 Eric also shared a screen shot of an APP he used to track the distance and duration of their hike. Notice that they burned a whopping 843 calories! If you love APPs and the ease of texting technology, you’ll be happy to know that we’ve placed a secret code word at the end of each challenge activity. Simply text the code word to the number posted on the sign and the completion of your activity will be recorded as you progress throughout the Parks Fitness Challenge. The Parks Fitness Challenge is happening now, so go on and sign up already, get out there and start having some fitness fun – you might even run into the Todd family! We also want to hear from you, too! Tell us about your experiences with the challenge, take photos and post them on our Fan page or send them directly to us at fitnesschallenge@kingcounty.gov and we’ll feature them here as motivation for others to get outside for some fitness fun. Next Post Get your presale tickets for Pink Martini, coming to the Marymoor Park concert series this summer!